Trying to find a keto-friendly snack can be pretty tough unless you stick with the same old nuts, veggie sticks or just a cup of cream-filled coffee. That’s what makes beef jerky so awesome. At virtually zero carbs and tons of healthy fats and protein, beef jerky makes the perfect treat in between meals on a ketogenic diet. And the fact that they’re packed with tons of bursting flavor makes this snack even more enjoyable. You may have seen beef jerky on the shelves of the grocery store and even tried it a few times, but what exactly is it? Jerky can really be any type of meat, including chicken, pork, or turkey. But beef jerky tends to be the most popular. Basically, beef jerky is made by marinating beef with a specific curing solution and drying it. Meat that has been treated this way is able to maintain a very long shelf life without the need for refrigeration. Jerky is cured with a salt solution to reduce the moisture to less than 50% of the total. It typically has a much more potent flavor compared to meat that has not been processed in this way. That’s because of the moisture removal process and flavor concentrating effect. Beef jerky is low in calories and cholesterol, yet high in fat and protein. They also come in several flavors today. Beef jerky is typically very low in calories, which makes it a great option for keto dieters who are sticking to a strict daily caloric intake. It is also high in protein and healthy fats, which is the ideal food product to include on a keto diet. Beef jerky is also usually high in vitamin B12 and iron while being void of carbs, helping keto dieters maintain a state of ketosis. Too much of anything is not necessarily a good thing. And depending on the quality of the beef jerky that you’re consuming, you could be doing more harm than good if you overdo it. This is especially true if the jerky is high in sodium and unhealthy fats. Many beef jerky products out there are loaded in sodium. More specifically, beef jerky contains about 2,081 mg sodium per 100g serving on average, which means you risk increasing your blood pressure if you eat too much of it. This, in turn, increases your risk of stroke, heart disease, and kidney pain. It’s recommended that adults take in no more than 2,300 mg of sodium per day. So if you’re eating a few sticks per day, you can easily reach and even go over your daily sodium limit. The types of meat cuts that are included in beef jerky may also increase your intake of unhealthy fats. Saturated fat and cholesterol can increase your cholesterol levels. A 100g serving of beef jerky has 11g of saturated fat and 61 mg of cholesterol. Adults should eat no more than 10% of their daily calories from saturated fat based on a 2,000-calorie diet. 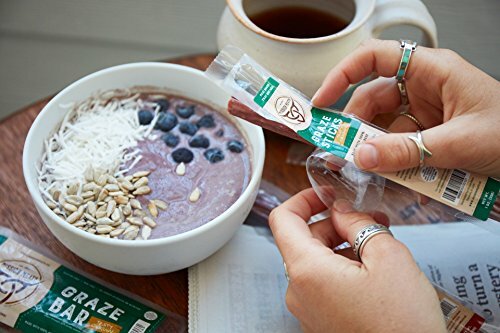 Again, the quality of the beef jerky matters, which is why it’s important to choose products that are not only keto-friendly but are relatively low in sodium and saturated fats. If there was one food product or snack that was meant for the keto diet, it’s beef jerky. This snack makes the perfect accompaniment for any keto dieter. That said, there are plenty of beef jerky products out there that have a lot of sugar. That’s why it’s so important that you read the labels and make sure that the product you purchase is either very low or completely void of sugars at all. Steer clear of anything with added sugars, because this will jack up the carb content and potentially kick you out of ketosis. What to Look For in a Low Carb Beef Jerky? When shopping around for beef jerky, make sure that you choose a product that is low in sugar. Also, certain flavors can increase the carb content, so stick with flavors that are low in carbs. Also, make sure to calculate net carbs when on keto to maintain a balance. Keep an eye on the sodium content as well. Remember: you shouldn’t consume any more than 2,300mg of sodium per day, and certain beef jerky brands tend to come loaded with sodium. Pay attention to the fat content as well, as certain cuts of meat that are used to make beef jerky can be low in fat. As a keto dieter, you’ll want to make sure the fat content is rather high, but you also want to make sure that the type of fat is healthy as well. Below, we review some of the best low carb keto-friendly beef jerky that you can purchase. Keto Carne beef jerky has zero carbs or sugar per serving, making it a perfect addition to any keto diet. In fact, there are only three ingredients in this product: beef, spices, and water. While you might think that just three measly ingredients sound pretty plain, the flavor is anything but. Keto Carne beef jerky is super flavorful and isn’t overly salty or dry. If you are particular to spicy meats, this product may be right for you. That said, there is also the original flavor that is available for those who prefer something a little more traditional when it comes to beef jerky. It’s neither too chewy nor too tough, so the texture is just right for the perfect chew. Keto Carne uses quality fatty cuts of beef, making this product perfect for the keto dieter. 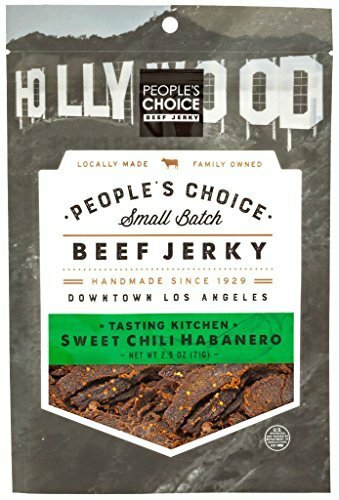 People’s Choice makes plenty of different keto-friendly products, including their beef jerky, as well as jerky pieces, sticks, and jerky chews. For a protein boost, the machaca works well as it’s made out of leaner cuts of beef. For a more traditional protein/fat combo that keto dieters look for, the sticks are the better option as they’re made with fattier cuts. All products contain zero net carbs, making the perfect addition to any keto diet. As far as flavors are concerned, People’s Choice offers plenty of different delicious flavors to please your palate. In addition to old-fashioned beef jerky flavors, there are also Hot & Spicy, Flamin’ Hot, Garlic Ginger, Orange Honey Teriyaki, and Limon Con Chile Carne Seca jerky. This company has been making and selling beef jerky for 89 years and four generations, so they must be doing something right. Just because you’re following the keto diet doesn’t necessarily mean that you can’t incorporate other diets as well, as long as they fit and don’t compromise each other. Paleo and Whole30 diets are good examples. If you’re also following these particular plans, Chomps beef jerky is a perfect accompaniment. 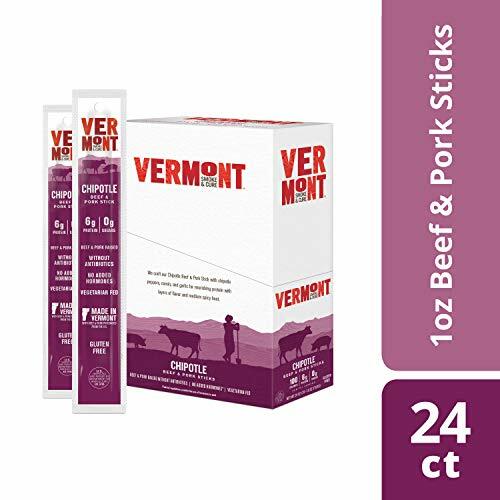 Their meat snacks are compliant with all of the above-mentioned diet plans and are made with grass-fed, free-range meats that are raised with no antibiotics or hormones. They’re also void of sugar and carbs and are relatively low in calories per stick at about 100 calories each (depending on the flavor). Each stick also contains 6g of fat and 9g of protein. They’re tasty and fit right into the ketogenic lifestyle. These beef jerky sticks contain at least 40% less sodium and 45% less fat compared to other beef jerky products. The company also makes jerky from pork and turkey. Everything is naturally smoked at Vermont Smoke & Cure’s local Vermont smokehouse using high-quality meats, and there’s no addition of any high-sodium nitrites. Each one of the company’s products is jam-packed with tons of flavor, so you can be sure to get a tasty snack while sticking to your keto diet. And since they’re so low in calories, you don’t have to worry about going over your daily caloric limit. 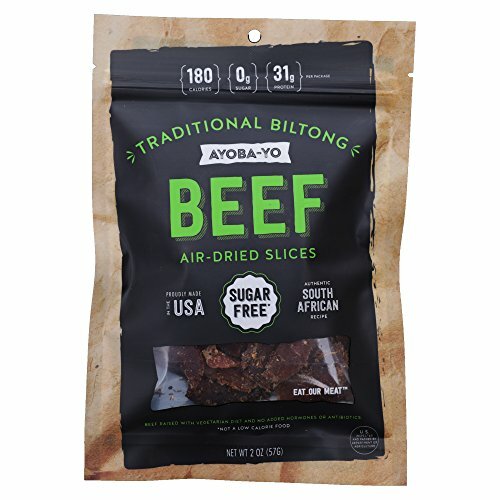 This product isn’t necessarily “beef jerky,” but instead “biltong,” which is a South African meat snack that’s pretty similar to the traditional North American treat. Ayoba-Yo’s biltong is made using a much longer air drying process compared to the way that beef jerky is made. As a result, the flavor and texture of the biltong really comes out. This product is made using all-natural ingredients, including beef, vinegar, and spices. For keto dieters, there are zero net carbs, making it the perfect snack to indulge in while watching your carb intake. If you want to find a product that tastes good and is socially aware as well, you’ve found it with Mission Meats beef jerky. A portion of every sale of their products is donated to a charitable social organization. And as far as the product itself is concerned, you can’t go wrong. 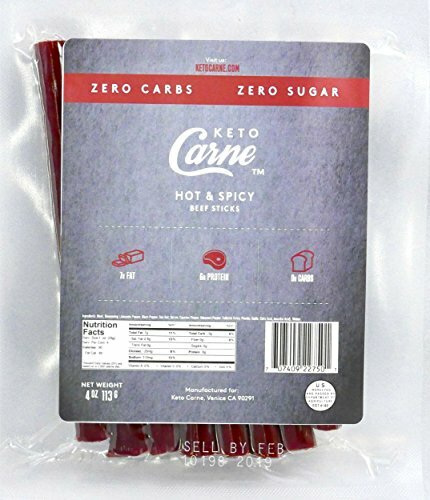 Mission Meats beef jerky fits really well into the keto diet with just 1g net carbs. They’re also made with grass-fed beef, water, and spices. That’s it: No other ingredients or preservatives are added, and they still have a long shelf life. And there are only 80 calories per stick, making them a great low-calorie snack option when you get those mid-afternoon munchies. Beef jerky makes a great addition to the keto diet. They all fit the bill in terms of fat, protein, carbs, flavor, and texture. Beef jerky really is a great snack option for anyone following a strict keto diet, so stock up on your favorite beef jerky product today! I love that the “Mission Meats” jerky has cons of : “Takes 30 to 40 minutes to warm up and connect to the software before starting” and “Requires a power source”.